Your biggest health predictor isn’t your cholesterol level, your blood pressure or your age; it’s your ZIP code. That’s what David B. Nash, M.D., dean of the Jefferson College of Population Health at Thomas Jefferson University in Philadelphia, asserted during his presentation at the American College of Healthcare Executives Congress on Healthcare Leadership. He noted, “The most important five-digit number I need to predict your health status and well-being is your ZIP code.” As Nash suggests, geography is a big factor impacting an individual’s overall health—from access to healthcare and information to quality of life, and even life expectancy. Two of our clients in differing ZIP codes and regions—one in Chicago and one in Washington, D.C.—are approaching their population health management through an analysis of their patient’s health and an understanding of their most at-risk residents. Both clients are constructing new outpatient facilities focusing on the patient experience, an efficient staff flow, and high-quality medical care; all delivered through a well-organized floor plan based on patient throughput and service-line adaptability. They are capitalizing on the connection between design and health. 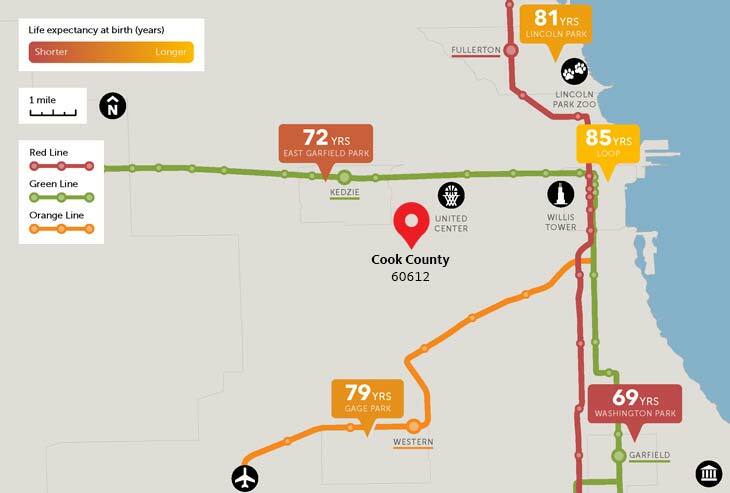 Life expectancy can differ by as much as 16 years between the seven “L” stops that separate The Loop in downtown Chicago from the city’s surrounding neighborhoods. Map courtesy Virginia Commonwealth University. The zip code of 60612 is located in Chicago’s Near West Side neighborhood. The median household income here of $25,143 is significantly lower than the U.S. average ($56,604). The map above from the Virginia Commonwealth University (VCU) Center on Society and Health indicates that life expectancy can differ by as much as 16 years between the seven “L” stops that separate The Loop in downtown Chicago from the city’s surrounding neighborhoods. VCU’s research illustrates that health is influenced by a complex web of factors including education and jobs, safe and affordable housing, availability of nutritious food and places for physical activity, as well as access to healthcare, child care and social services. As a safety net for healthcare in Chicago and suburban Cook County, the new health center will connect directly to the John H. Stroger, Jr. Hospital, the main hospital serving CCHHS. The system also includes Provident Hospital and 16 Ambulatory and Community Health clinics. Known by many due to the popular television show “ER,” Cook County began providing health care to the poor in 1857 in a hospital built by the City of Chicago. 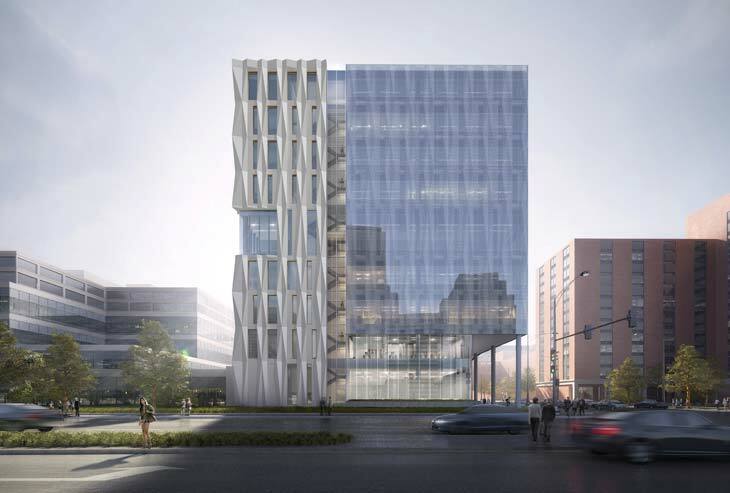 Gensler is the design architect for the new nine-story, 282,000-square foot Central Campus Health Center, a building supporting their clinical, educational and administrative functions. This new state-of-the-art ambulatory care facility will include 100,000 square feet of flexible, patient-centric clinical space and 150,000 square feet of highly collaborative education and administration space. Clinical services will include primary care (the largest practice group), as well as medical oncology; infusion; endocrinology/diabetes; ophthalmology; otolaryngology; dermatology; oral health and employee health. CCHHS sees more than 100,000 unique patients through over 550,000 clinic visits annually on the central campus. The new building will visually communicate the future of accessible, community provider healthcare. A transparent lobby design engages the surrounding neighborhood and activate its streetscape. The architectural design reinforces the CCHHS vision of providing health services with dignity, through community partnership, while advocating for the physical and mental well-being of Cook County residents. This project is a unique partnership that encompasses residential, job training, and health services co-located at one location. The project will enable Unity to provide comprehensive health programs and services, while collaborating with SOME on innovative methods to treat residents where they reside. The hope is to deepen our understanding of the synergistic effects of quality care and housing in relation to health outcomes. Life expectancy in our nation’s capital along subway stops can vary by seven years. Map courtesy Virginia Commonwealth University. It is estimated that this facility will provide healthcare annually for 24,000 patients. Unity Health Care (Unity) was founded in 1985 as the Health Care for the Homeless project, providing primary healthcare services to homeless individuals and families in D.C. When they received federal government emergency funds in 1996, their reach was expanded to include the underserved, uninsured, and working poor. Unity has a mobile medical outreach vehicle and 29 health centers that are located in the poorest ZIP codes surrounding Washington, D.C. When space is a premium and patient throughput is needed for an efficient patient journey, flexibility is at the core of all planning. 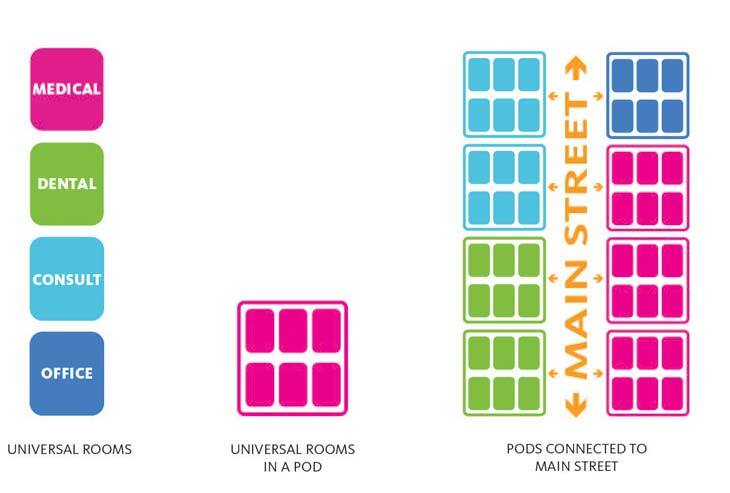 Unity’s exam, procedure, testing, and consultation rooms are designed using universal room sizes and a typical clinical pod includes two or three universal rooms per provider, depending on their clinical specialty. Both the Cook County facility and the Unity clinic have developed a “main street” access to the clinical pods to support patient wayfinding and efficient patient flow. Evidence based design strategies of positive distraction integrate color, graphics and art in reception and waiting zones to reduce stress. Staff spaces are also strategically located close to natural light and clustered to support the medical home staffing model where all care providers share the same working zone. As these cases illustrate, it’s critical to recognize the impact that zip codes can have on well-being and health. This is especially apparent in underserved communities, where populations who live just a short distance from each other have noticeable health disparities from neighboring communities. Culturally relevant, patient-centric design strategies, like CCHC and Unity Health Care, can help improve population health and provide access to quality care, regardless of your zip code. Tama Duffy Day is a Principal and Firmwide Health & Wellness practice area leader. A strategic thinker with extensive experience in a diverse range of projects, Tama is dedicated to raising awareness of the power of design to impact lives and enrich communities. Being actively engaged in both referenced projects, she experiences first-hand the positive impact that access to health has on community. Contact her at tama_duffyday@gensler.com. Scott Hurst is the senior designer of CCHC and a senior associate at Gensler Chicago. His design work has been featured in publications including Interior Design, MIT’s The Journal of Architectural Education and Wired. Outside of the office, Scott is a proud contributor to the ACE mentor program, Chicago Loop Alliance, Urban Land Institute and the Ronald McDonald House. Contact him at scott_hurst@gensler.com. Bonny Slater designer of the Unity Health Care project and a CCHC team member, is a senior designer for the Health & Wellness practice area in Gensler Washington, DC. With degrees in both design and environmental psychology, her research-based solutions reflect the local cultures and identities of her diverse clients, from community health centers to foreign medical cities. Contact her at bonnie_slater@gensler.com.